I have a 1994 F-150 truck that has some electrical problems. Notably, there are the remnants of an alarm system in it. This alarm system also has a kill switch function that at times disables the truck. Since I use this truck infrequently I’ve battled this alarm and the battery draining for years. I have tried a couple of times to have this alarm system removed, but have been unsuccessful in finding all the parts. Therefore I’ve resorted to addressing the symptom rather than spending any more time, effort and money to remove the alarm system. To do this I installed a battery disconnect switch. A couple of quick turns of the green knob either connects or disconnects the battery from the electrical system of the vehicle. 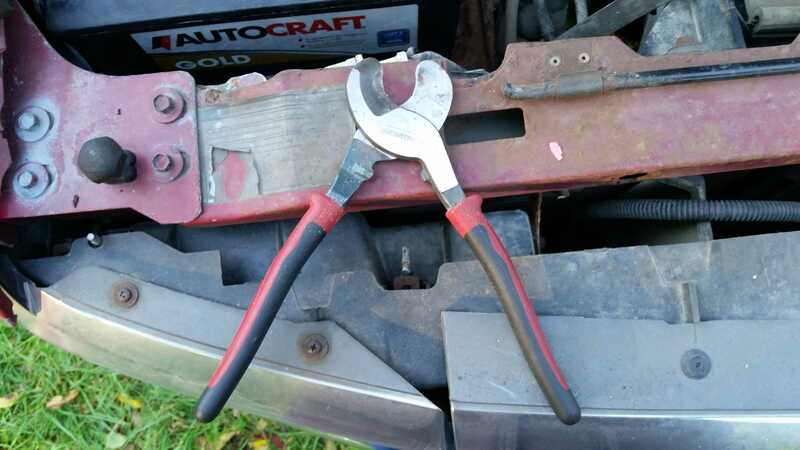 Now when I want to use the truck I tighten of the knob and it starts right up. Anyone who has vehicles or tractors that are used infrequently may find such a disconnect switch to be of value. Of course you lose any saved settings in something like a digital radio, but to not have your battery drained is worth it. Many newer vehicles have phantom loads that consume power, in small amounts, but never the less are there. I have heard that the Toyota Prius has something like a parking or storage mode where the engine will start periodically to recharge the batteries. I suspect this has a much bigger phantom load than other cars. Older vehicles should have no phantom load. 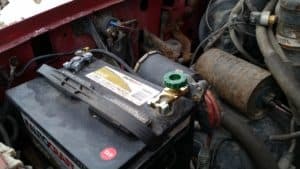 Lead Acid batteries do have a self-discharge rate of about 5% per month so you cannot just disconnect a battery and expect it to stay good forever. That is why there are such things as trickle chargers, to keep batteries topped up and keep the batteries from being damaged by discharge. Take care of your batteries and they will take care of you. I’ve been having trouble with an old Ford F-150 trick I’ve got. I don’t use it regularly and frequently when I try to use it the battery is “dead”. However this last time I looked into it the problem wasn’t really the battery. When I took off the cables and hooked the battery charger directly to the battery it was something like 85% charged. This led me to take a closer look at the positive cable (I’d already replaced the negative). 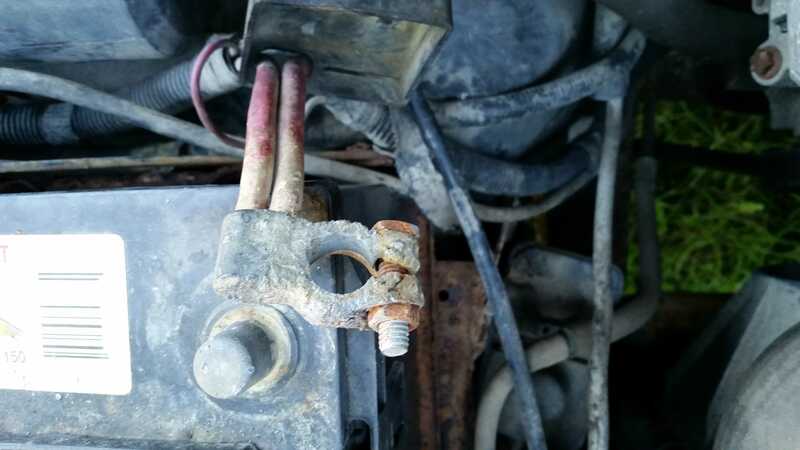 If you look closely you will see a crack in the terminal clamp. This is made of lead and it is soft enough so that when the nut is tightened it forms a tight contact with the battery post. However since this one was beat up and cracked it would not form a tight connection. For low voltage connections it is important to keep them “Clean, Bright & Tight” or you will have continuous problems. This one kept corroding because it wasn’t maintaining a tight metal to metal connection. This increased the resistance to the point that the current flow wasn’t enough for the truck starter to turn. 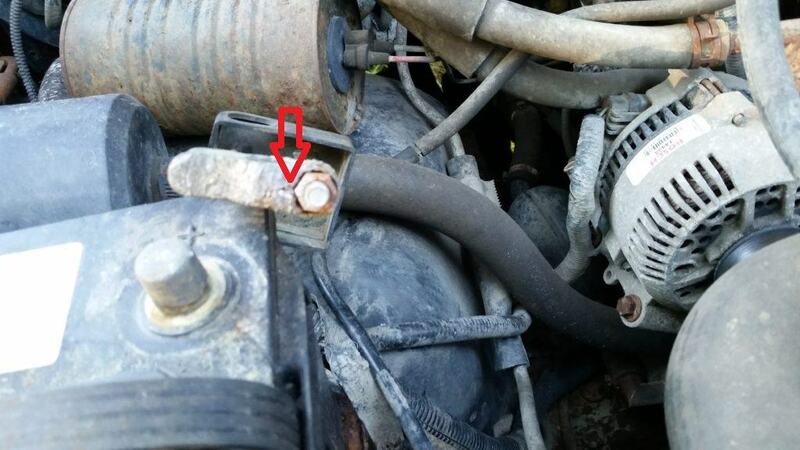 To fix this it is a simple mater of cutting off the old one and attaching a replacement terminal clamp, available form any auto-parts store. Notice that this one has two heavy gauge wires cast into the connector. However it takes a bit of effort to cut cable this thick with regular wire cutters. There is a set of cutters with curved jaws and a longer handle that makes cutting this size wire feasible. If you don’t have a pair of these try taking smaller bites out of the cable and maybe you can work your way through the cable. The image at the top shows the finished project. It only took about 10 minutes and the job was done. If I’m correct in my troubleshooting then this should stop my problem. 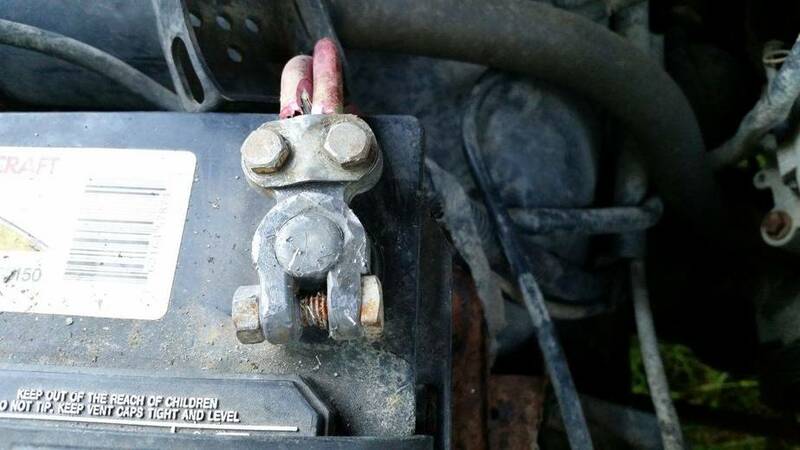 You should consider checking your battery terminals every fall before cold weather sets in (assuming you live where it gets cold). It takes more current to start a car in the cold and if the connection is loose or corroded then you might find yourself stranded in the cold.